March 2016 – What's in That Yard? What is building a Hugelkultur bed like? This post is a cross between What is Hugelkultur? and What is having a natural yard like? It is That Blog’s first photo-essay. In this essay, the goal is to build a sun trap. A sun trap is a warm, sunny microclimate. In this case, the chosen site is a south-facing slope: it is sunny most of the day. A Hugelkultur bed along the north and east sides will protect the site from wind. The first step is to cover the site for about six months, to kill whatever is already growing there. Old carpet makes great sheet mulch. Next, use a length of rope to mark the outline of the work area. Build the Hugelkultur bed from old wood. Stuff the cracks with leaves, plants and sod dug out of the work area, and other organic material. Add water. Make the pile bigger than it needs to be, because it will shrink a lot as it decomposes. Clear the old plants from the sun trap area. If it’s small, this can be done with hand tools. If it’s larger, a sod stripper may be appropriate technology. Spread clean soil over the area. Cover the Hugelkultur bed with mulch. Replace the sheet mulch until it is time to add plants to the sun trap. For this project, the prepared site will be left to settle for a little while before new plants are added. This project took approximately ten hours over three days. All tools and materials were already onsite, except for the cart in the second picture. What was bird species #38? What’s that hopping around on the side of the tree? 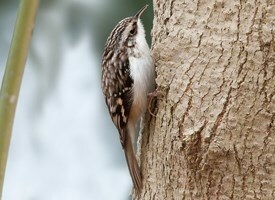 If it’s not a woodpecker or a nuthatch, it must be a brown creeper. A bird’s behavior, along with its markings and song, offers important clues to identification. Perching on the trunk of a tree, rather than on a branch, is an unusual behavior that quickly narrows down the list of suspects. Some bird species perch this way in order to search for insects in the bark. A second probably-new species was also observed in That Yard today, but has not yet been identified. Hugelkultur (pronounced who-gull-cull-ter) is a way of building raised beds. The technique has been used for hundreds of years, and mirrors the way nutrients return to the soil in a forest. A Hugelkultur bed is a low mound built of dead wood covered with other organic materials. The decomposing wood gradually turns into great soil for new plants: it releases nutrients, holds water, and keeps plants warm with the heat produced by the composting process. A Hugelkultur bed is easy to build, and uses materials that are often found in yards for free and thrown away as waste. The first step is to place logs, branches, or other woody material where the mound will be built. The material can be placed in a shallow trench, or can be broken up so that it will lie close to the ground. Contact with the soil helps the decomposition process. Watering the pile thoroughly also helps the organic material begin to break down. Once this “frame” has been built, the spaces between the wood can be filled with leaves, grass clippings, food waste from the kitchen, and other small organic matter. Finally, the pile is covered with topsoil or mulch. The bed can be planted into immediately, with either seeds or transplants, or can be left to break down for a few months before being planted. The new occupants of the bed will benefit from both the quality of the soil and the favorable microclimates that develop on mounds. California has recently adopted new state-wide ordinances limiting the size of lawns. As of December 1, 2015, lawn cannot occupy more than 25% of the landscaped area of a property. This rule takes effect immediately for all newly-developed properties. Existing homes and businesses will be required to come into compliance if they undertake major renovations of their current landscaping. The primary purpose of the law is to reduce water usage. The new limits on lawns are expected to save 20% of the water usage of a new home, or 35% of a commercial property’s water use. The new ordinances also limit turf grass on street medians and terraces, and require lawns on commercial properties to be intended to serve some functional purpose, such as recreation or public assembly. Many California property owners got rid of their lawns even while having one was still legal. Last summer, the state stopped offering cash incentives for lawn removal, after emptying its $340 million fund earmarked for that purpose. Are there public examples of natural gardening in Madison? On the east side, Olbrich Botanical Gardens provides examples of low-mow turf, gravel gardens, and other alternatives to traditional lawns. The gardens incorporate sustainable practices such as on-site composting and minimal use of pesticides. On the west side, the Arboretum showcases communities of native plants. These can serve as inspiration for a yard-sized landscape that emulates nature. The Arboretum also hosts an annual native plant sale and native gardening conference. This year’s plant sale is May 7; advance orders must be placed by March 25. Downtown, the Allen Centennial Gardens at the University hosts groupings of plants that could fit in a typical backyard. These demonstrations are accompanied by informative signs. There is also a lawn area that is maintained without pesticides, artificial fertilizers, or gas-powered equipment. All three of these gardens are free and open to the public. Take advantage of the spring weather to visit one!